Whoa, there appears to be a tear in the fabric of space time, this posting didn't happen. Huh? It was written and then never appeared. My tin foil beanie is failing to save me from the CIA mind rays that they are beaming into my house. wakka wakka. 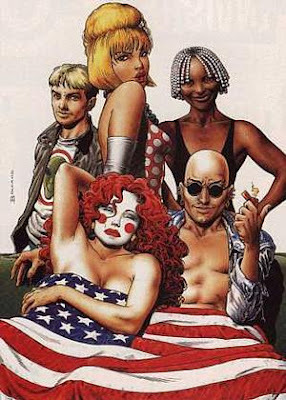 This inspiration was written my arse bonkers hyper mage himself Grant Morrison and it is a hyper sigil disguised as a comic book The Invisibles a super dense adventure of conspiracy, action, magick, existential idea and post structuralist theory. Designed to effect your reality. Haven't been on this trip? Oh you must.